The production of both biochar and green charcoal is from the same feedstock, bagasse, the leftover residues from pressing sugar cane. Because the sugar cane is brought to centralized processing facilities for pressing to extract the syrup, there is good access to large amounts of the bagasse residue in a central location. Bagasse is also one of the few agricultural residues in Haiti that has little other useful purpose in that it is not used for animal feed or for compost. Often, Haitian farmers pile bagasse residues and burn them for disposal. The feedstock is fairly dry depending on the season, but in the wet season, keeping the material dry can be a challenge unless it is stored under a tarp. CRI has found that bagasse is a good feedstock to convert into charcoal and they get a 40 – 50% conversion based on weight. CRI and their partners at a local organization, Makouti Agro Enterprise, hold workshops on charcoal/biochar production using 55 gallon TLUDs. These workshops are available to local farmers and entrepreneurs, and after the workshop a participant can take home one or two kilns on a lease-to-own basis. 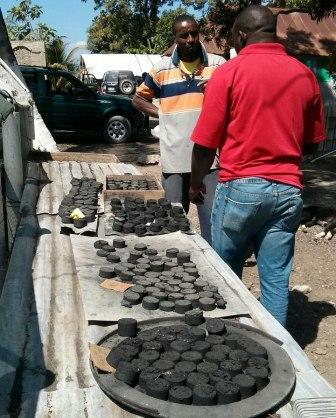 CRI has found that some participants spend a few hours a week producing charcoal/biochar while others work full-time. The kiln design has gone through a couple iterations over the last three years to make it most useful for utilizing bagasse and other feedstocks available in Haiti, and to be as affordable as possible. Once participants take the kiln home, they then make char on their own (the entrepreneur is responsible for acquiring the feedstock) which they then sell to CRI. CRI transports the char to a central facility where they produce green charcoal briquettes as well as biochar. At the central facility, CRI presses most of the char into green charcoal briquettes, which are similar to traditional wood charcoal but cost less. The target cost is to make green charcoal cheaper than wood charcoal so it is more quickly adopted in the marketplace. CRI is looking into ways to increase the longevity of the green charcoal in the stove by increasing the density or changing the briquetting process. But there is a critical time element to increase adoption of green charcoal in the marketplace—it is possible that the Haitian forest will be gone in the next decade if present logging trends continue. 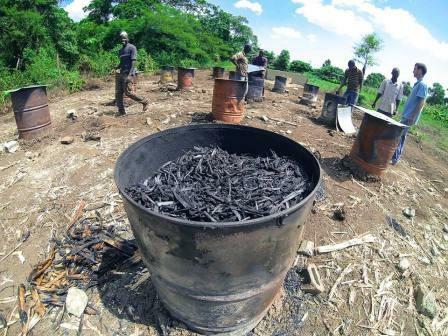 The government is implementing reforestation projects, but few if any alternatives to wood charcoal are available for cooking, so many of the reforested trees are being cut down. CRI started the Haitian project believing it would mainly be a biochar project, but found the demand for cooking charcoal so high that they are making both products. 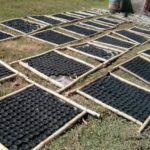 CRI does not yet see a strong market demand for biochar, so they are using the green charcoal profits to subsidize biochar tests, collaborations, and projects to do as much as possible until they can find a way to increase the use of it in Haiti. While most of the char that arrives at CRI’s facilities is pressed into briquettes for cooking, the remainder is mixed with local organic nutrients and turned into a biochar/compost blend. 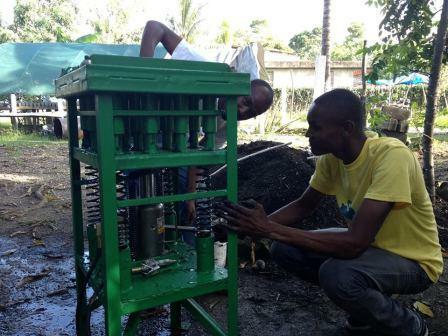 CRI then cycles the biochar back to farmers to raise their agricultural productivity. They are also moving into larger scale collaboration projects with biochar and have field tests on an 8 acre piece of land growing tomatoes, peppers, millet, and cassava in biochar amended soils. Additionally, CRI is collaborating with Meds & Food for Kids on a large-scale biochar trial with peanuts. CRI gets its largest funding from the United States Agency for International Development (USAID) and recently received funding from USAID’s Development Innovation Ventures Grant. They have also received grants from foundations which have helped them move to a larger number of staff and projects on the ground. For more information, please see: http://www.carbonrootsinternational.org/ or contact Ryan Delaney at rdelaney@carbon-roots.org. Producing the char (all photos courtesy of Carbon Roots International). Quality control of different briquettes. 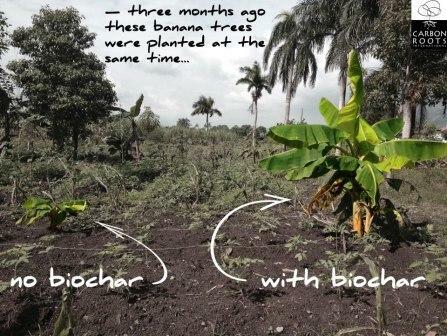 Planting crops with and without biochar.